Superb Audiophile Speakers ... in red of course! Design Brief: The Design Brief was simple – a multi-room audio system and a ‘drop dead’ Cinema Room – the only catch being that the Cinema Room also had to function as a beautiful modern lounge. With the help of Chaplins, the red lacquer Morel speakers selected nicely contrasted with the elegant furniture – you see the lady of the house loves red! Solution: The 5.1 Dolby surround sound speaker system was hidden in the lounge ceiling (including a special in-ceiling subwoofer). Unlike many other ceiling speakers, these Morel units are completely sealed, ensuring minimum leakage to the children’s bedrooms upstairs. The quality of the Morel’s is quite amazing given their size – greatly helped by the eyeball design allowing the speakers to be pointed towards the listener, greatly improving high frequency distribution. The HD Projector was also recessed into the ceiling - coming into view at the touch of a remote. The Pleasure Home does not like the traditional concertina projector lift mechanism as they never seem to go back to the same position. Instead they deployed a new swiss product, featuring a patented fine screw mechanism, providing extremely fine control, so that the projector is ALWAYS lowered in exactly the position that the image fills the entire screen. Finally, something we don’t normally recommend, but the client wanted to completely do away with the traditional projector screen or recessed electric screen. We were able to source a special white paint designed to function as an excellent Projection surface – after of course the wall was finely sanded. 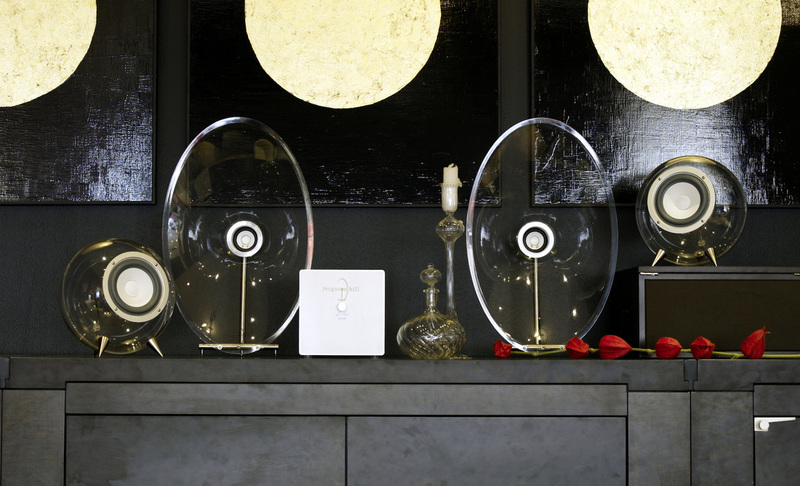 Transparent Speakers: The Study features the Ferguson Hill transparent speakers, with dedicated spherical subwoofers and an aluminium encased amplifier. Sonos throughout: ​The Lounge, Kitchen and Study all being controlled by the extremely easy to use Sonos App. 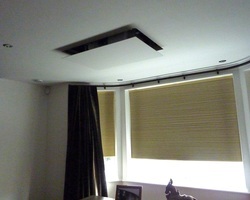 ​The total installation cost was under £30,000.